Who’s Right for Quincy Capital? Investment Management Do you have a winning investment strategy that deserves broader distribution? If you are an independent asset manager who is looking for a distribution partner, we can create a flexible and versatile business plan for you. 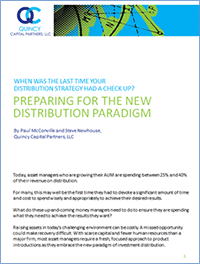 Implementing the plan with a distribution strategy that works best for your organization and resources. RIAs & Advisors Do you want to generate more revenue from new sources? If your firm is looking to enter the intermediary space, bolting on a nationwide network or wholesaler sharing offers another way to broaden your capabilities. Key Accounts & Relationship Management Gaining access to platforms is critical for success. Quincy Capital has built relationships with key gatekeepers to not only get your product noticed and accepted, but position your brand more prominently with those that count. Quincy Capital Partners has the resources to add breadth and depth to your current marketing strategy. If you don’t have a marketing strategy, we will help you build and implement upon engagement. From web site development to social media or segment-based marketing, we can show you how to construct a thought leadership strategy and communicate your core competencies to your target markets in a new, focused and compelling way. Through our partnership with creative financial marketing leaders like AlphaSegment we can also implement a way for you to reach out to new prospects.